As I arrived at LFS I was expecting a lesson in creating pretty flowers. And firstly I have to say, what an amazing space! 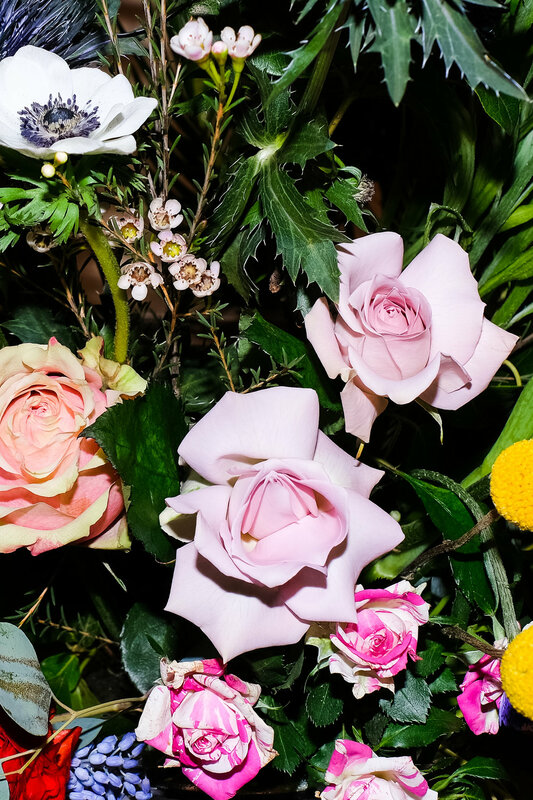 The old Estee Lauder training centre has been taken over by the founders of London Flower School and turned into an airy, open space that's perfect for practical learning. I was taking the 'inspired by art' class. The staff introduced themselves. They were incredible - so passionate and knowledgeable. These people oozed creativity and all have such credible backgrounds coming from the likes of Claridges and McQueens. We started the session talking about how Dutch still life painters captured the beauty of flowers in weird and wonderful displays. We observed the paintings and how they used different types of colour palettes - analogous, complementary, triadic and split complementary, before being introduced to the flowers we would be using in our first creation. First, we worked on an asymmetric front facing arrangement in a shallow display dish thing (technical term yeah) using something called a flower frog. A clever little contraption, a flat base with spikes that allows you to impale the stem of a flower and have it stand upright. Brilliant for creating dramatic looks. This is a flower frog. And then it began. We were taken through a demonstration where the tutor worked, and we basically, watched. He instinctively selected flowers and arranged them into a shape like nothing I'd ever seen on sale before. Hell, like nothing I'd seen displayed anywhere before, ever. This wasn't 'flower arranging'. This was ART. First we created an asymmetric shape using bigger, stiffer flowers such as eucalyptus and thistle. Then we grouped together colourful flowers as we went then finalised with little pops of contrasting colour. As I worked I realised that this wasn't an easy task. This blew everything I knew about flowers out of the water. Nothing I knew was relevant. These flowers weren't there to look pretty, they were there to capture your attention and make you be, simple, stunned. The high street bouquets were irrelevant. Weirdly I kept referring back to what I knew of flower displays, big and symmetrical, fan shaped almost. Without meaning to. The tutors helped me to see or 'feel' what I was doing with my display and move away from typical notions of what a beautiful floral display is. I LOVED THIS. It completely pushed me to break outside of everything I knew, in an area that I knew nothing about and create something extraordinary. I was super happy with how this turned out, but let me just say - I had a LOT of help! These were the other two students beautiful designs... AMAZING! It was so interesting how everyones were so different even though we all had the same flowers to work with. In the second half of the day we worked on a natural arrangement in an urn. This was using a more analogous palette of soft pastels. Instead of the flower frog we used chicken wire to create an internal structure which we could push the flowers in to. We then conditioned the flowers (removed leaves that would be under water and snipped the stems) and then used the same technique as the first arrangement - shape first, then the main pretty flowers and then some to 'bring it together'. I was told NOT to try and fill all the gaps, which again, instinctively I kept doing. ARRGH ALL THAT SOCIAL CONDITIONING ABOUT WHAT MAKES BEAUTIFUL FLOWERS! It was such a humbling experience to try my hand at something I knew nothing about and get into the mind of what makes a contemporary display. I can imagine some people would think this looks mental but I loved it. It's so expressive and instinctive. And above all, it's art. I think I've fallen in love with this! I wholeheartedly recommend the Inspired by Art class at London Flower School. The tutors are so incredible passionate and talented, it really is like watching art come to life in front of your eyes. I feel so humbled to have been taught by them and I can't wait to create more wacky displays! You can click here to learn more about the LFS and see all of their courses.